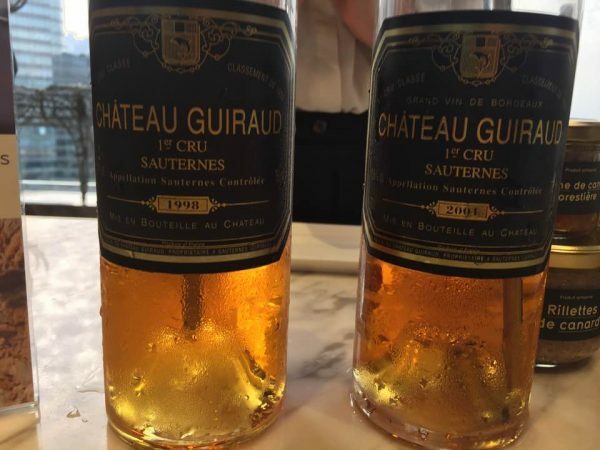 With Bordeaux exports to China reaching all time high, grand cru Sauternes estate Château Guiraud is reporting an increase of its sweet wines’ sales in China. It seems consumers from northern China, southern Guangzhou and Sichuan province in southwestern China are particularly smitten with the sweet wines from Guiraud. Sales to China on average account for at least 20% of its total sales, the chateau’s Asia ambassador, Vincent de Beler, told dbHK at its Christmas party in Hong Kong on 13 December. By way of example, the brand ambassador said its 2013 vintage from the 85-hectare organic winery was already sold out in China. The château opened up a warehouse in Hong Kong’s neighbouring Shenzhen in 2011 to ensure authentic and ready supplies. “The reaction we got from the UGCB (Union des Grands Crus de Bordeaux) tour in China earlier this year was fantastic, we have people lining up in front of our booth to taste our wines, ”said de Beler, referring to the UGCB China tour that brought nearly 80 grand cru classé châteaux to several Chinese cities including Beijing, Shanghai, Chengdu, Changsha, Qingdao and Guangzhou to promote 2013 Bordeaux last month. Although the 2013 vintage in Bordeaux was not outstanding, top Sauternes estates’ sweet wines’ quality “can be trusted in 2013 in a way that their red counterparts mostly can not,” Jancis Robinson MW wrote about the vintage. “2013 was a challenging year for Bordeaux…It’s a testing vintage for winemakers. If five star represents perfection, I would give two or three stars to reds, but four stars for dry whites and Sauternes,” Olivier Bernard, owner of Domaine de Chevalier and president of the UGCB, said at Guangzhou during the UGCB tour. Bordeaux exports to China have been picking up since last year, and exports to China reached the highest level this year, with a growth of 22% from 2015, according to the CIVB.